increases student interest, motivation (Vazou et al., 2012), and learning (Braniff, 2011). improves content knowledge, skills, and test scores in core subjects such as mathematics and reading fluency (Adams-Blair & Oliver, 2011; Erwin, Fedewa, & Ahn, 2013; Browning et al., 2014). may help children meet the recommendation to complete the recommended 60 minutes of physical activity every day. 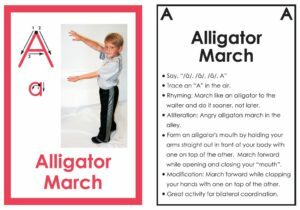 The ABC’s of Movement®- Combine Movement with Literacy – The ABC’s of Movement® is a pdf document of educational flash cards that combine movement with literacy development. Kids love these colorful flash cards that merge learning the alphabet with twenty six fun, noncompetitive movement activities. Designed for children of all abilities from preschool through 2nd grade, these flash cards were developed by a physical therapist with learning and physical development in mind. Ideal for home and school use. These bright, bold letters and full color photographs of children make learning easy and fun! 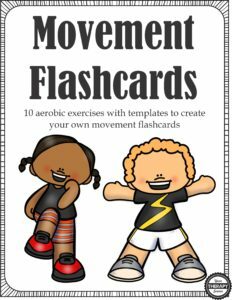 Movement Flashcards – Movement Flashcards digital download includes 10 aerobic exercises with flash cards templates. Students can get physical activity while reviewing material. The 10 aerobic activities include: run in place, jumping, hopping, squats, lunges, skipping, twists, cross crawls, jumping jacks and marching. Each page includes a picture image of the aerobic exercise along with a blank template to type in 18 flash cards. You choose what to work on for academic material. 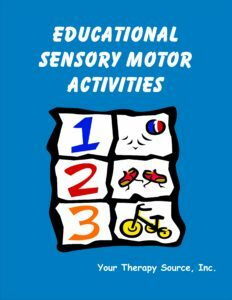 Educational Sensory Motor Activities – provides you with a great assortment of creative activities that are so easy to prepare. Simply copy the page and the activity is ready to go. Practice balance skills, coordination, fine motor skills, gross motor skills and sensory awareness all while learning academic material. Children will be entertained and motivated to participate while working on their motor skill and cognitive development. Educational Sensory Motor Activities is appropriate for children ages preschool through elementary school. Adams-Blair H., Oliver G. (2011). 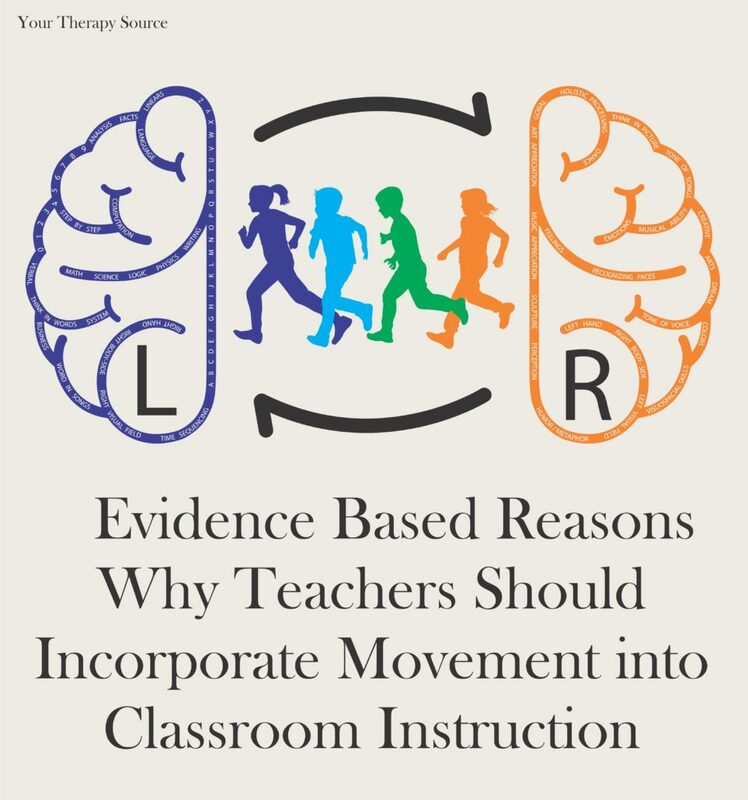 Daily classroom movement: Physical activity integration into the classroom. International Journal of Health, Wellness, & Society, 1 (3), 147–154. Braniff C. (2011). Perceptions of an active classroom: Exploration of movement and collaboration with fourth grade students. Networks: An On-line Journal for Teacher Research, 13 (1). Browning C., Edson A.J., Kimani P., Aslan-Tutak F. (2014). Mathematical content knowledge for teaching elementary mathematics: A focus on geometry and measurement. Mathematics Enthusiast, 11 (2), 333–383. Erwin H., Fedewa A., Ahn S. (2013). Student academic performance outcomes of a classroom physical activity intervention: A pilot study. International Electronic Journal of Elementary Education, 5 (2), 109–124. Vazou S., Gavrilou P., Mamalaki E., Papanastasiou A., Sioumala N. (2012). Does integrating physical activity in the elementary school classroom influence academic motivation? International Journal of Sport and Exercise Psychology, 10 (4), 251–263.